Genealogy essentially comes down to dates. The date a person is born and the date a person dies. Baptism dates, immigration dates, marriage dates, divorce dates. Dates, dates and more dates. 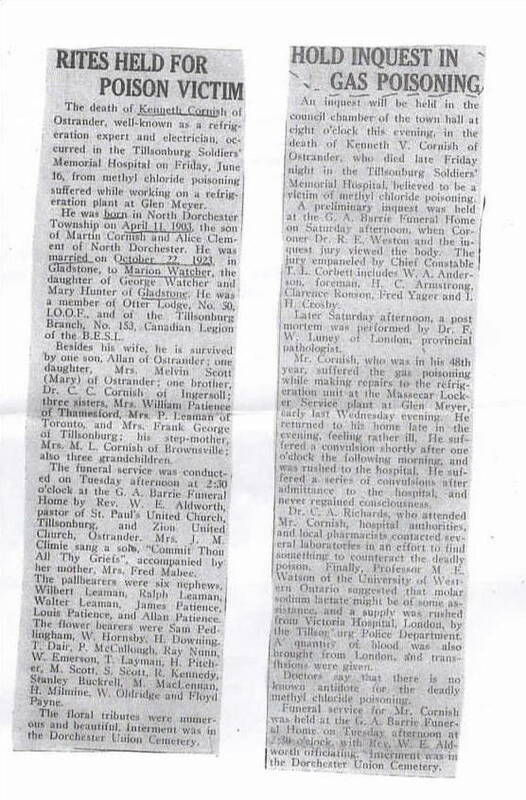 An inquest will be held in the council chamber of the town hall at eight o’clock this evening in the death of Kenneth V. Cornish of Ostrander, who died late Friday night in the Tillsonburg Soldiers’ Memorial Hospital, believed to be a victim of methyl chloride poisoning. A preliminary inquest was held at the G.A. Barrie Funeral Home on Saturday afternoon, when Coronoer Dr. R. E. Weston and the inquest jury viewed the body. The jury empaneled by Chief Constable T. I. Corbett includes W. A. Anderson, foreman, H.C. Armstrong, Clarence Ronson, Fred Yager and I. H. Crosby. Later Saturday afternoon, a post-mortem was performed by Dr. F. W. Luney of London, provincial pathologist. Mr. Cornish, who was in his 48th year, suffered the gas poisoning while making repairs to the refrigeration unit at the Massecar Locker Service plant at Glen Meyer, early last Wednesday evening. He returned to his home late in the evening, feeling rather ill. He suffered a convulsion shortly after one o’ clock the following morning, and was rushed to the hospital. He suffered a series of convulsions after admittance to the hospital, and never regained consciousness. Dr. C. A.Richards, who attended Mr. Cornish, hospital authorities, and local pharmacists contacted several laboratories in an effort to find something to counteract the deadly poison. Finally Professor M. E. Watson of the University of Western Ontario suggested that molar sodium lactate might be of some assistance and a supply was rushed from Victoria Hospital, London by the Tillsonburg Police Department. A quantity of blood was also brought from London and transfusions were given. Doctors say that there is no known antidote for the deadly methyl chloride poisoning. Kenneth’s obituary further provided details to his life. It mentioned he was a well-known refrigeration expert and electrician, he was married to Marion Watcher, had a son Allan and a daughter, Mary who were both married and had children of their own. He was also a member of the Otter Lodge and the Canadian Legion. He didn’t die of lung cancer, aneurysm or heart attack. He died a terrible, premature death and left a wife, 2 children and 3 grandchildren behind. He was a husband, a father, a grandfather. 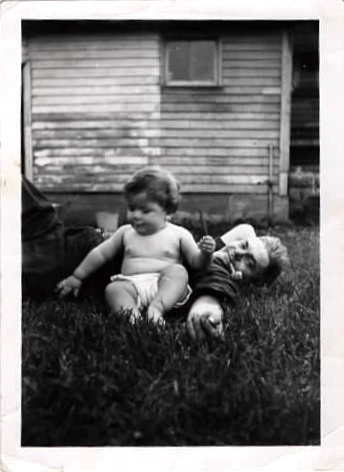 My father-in-law was only 2 when he passed and has no recollection of his grandfather and namesake. With these 2 columns clipped from an old newspaper, we got a glimpse of who this man was. 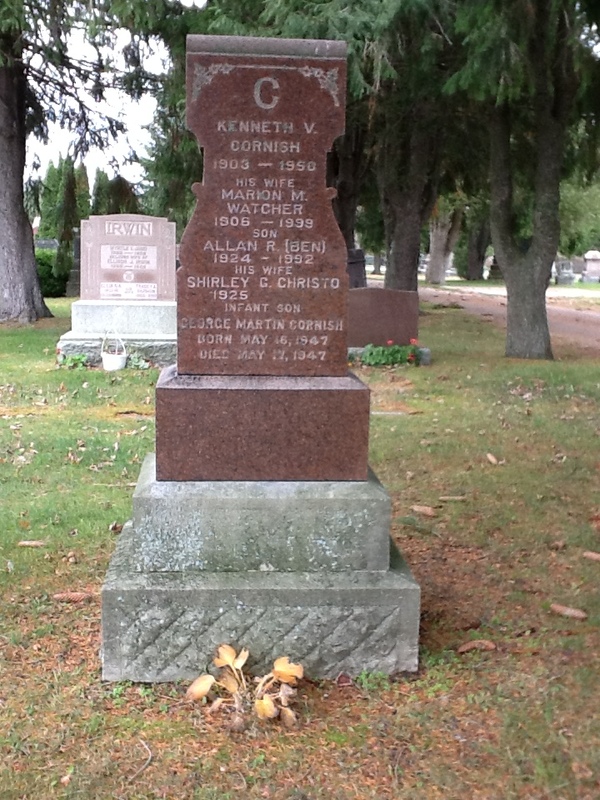 Kenneth Verne Cornish – no longer just a set of dates. Wow! What an interesting story! Thanks Beth. It really is amazing what you find when you least expect it. I am going to start lookin for obituaries of my family for more information. Thank you for this story of your family discovery. Thank you for stopping by Veronica. I find obituaries the most valuable of all resources. There is so much information that can be gained. Good luck with you obituary search.